Caption slip reads: "Photographer: Milligan. Date: 1954-04-13. Reporter: Dunn. Assignment: Man caught in experimental cooling tower at 2500 So. Atlantic Blvd. 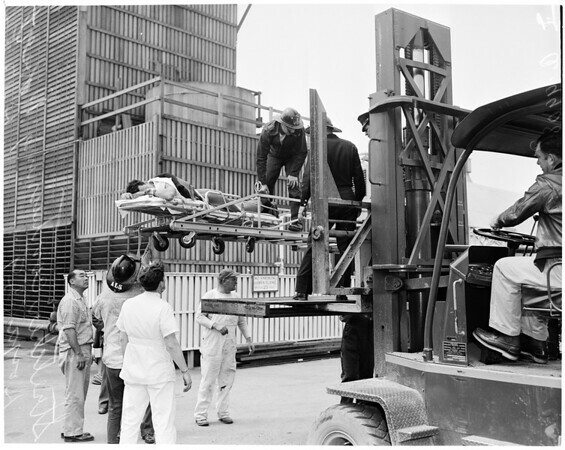 5-6: Bill McCormick, one of the rescuers, looks at a four-foot blade used on fan similar to one which cut Robert Loya, 29, test engineer at Fluor Corp. 7-8: Firemen and employees help to lift stretcher containing Robert Loya, 29, from fire ladder truck."